London, August 9 -- What most struck the eye at the coronation ceremony in Westminster Abbey today was the marvelous display of jewels, that certainly surpassed anything previously seen at a court function in England. The combination of these with the magnificent robes and beauty of many of their wearers made a memorable sight. As beautiful as any coronet there was a pearl and diamond tiara worn by Lady Londonderry , whose dress was heavily embroidered and covered with pearls and diamonds. She also wore a diamond stomacher, with bracelets and earrings to match. The robe itself was embroidered in silver and gold, working in the pattern of the family arms and coronet, and was fashioned after the style in the days of George III with big red velvet sleeves. The Duchess of Portland  was superb in her great coronet of diamonds, in the center of which was the famous Portland stone, which flashed and sparkled in a thousand colors in the dim light. The duchess was the object of general attention. 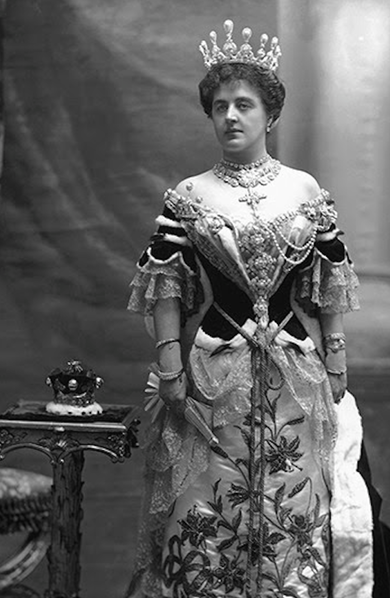 Her diamond necklace and magnificent ropes of pearls were unrivaled even by those worn by the Duchess of Westminster , whose jewels are old family heirlooms and have been regarded as without equal. Lady Chesterfield's  coronet was one of the largest worn in the abbey, no restriction seemingly having been made regarding its size. She had it especially made to suit her, and it was in striking contrast to many others worn by peeresses, who seemed to have made it a point to wear the tiniest possible coronets, just large enough to encircle the knot of hair worn on top of their heads a la Josephine. It was perhaps, after all, the Americans who made the bravest show, and on this occasion, as on many others, they played a very prominent part in the day's ceremonies, and contributed by their beauty and the magnificence of their robes and jewels to what was truly a gorgeous spectacle. Tall and graceful, with her small face overweighted with masses of dark hair, the Duchess of Marlborough (who was Consuelo Vanderbilt of New York)  was a center of attraction. On her neck was a high collar of pearls, with diamonds and rubies, and on her head a beautiful diamond coronet. Around her waist was a belt made entirely of brilliants. The duchess came in a state coach with the duke and two pages. Lady Dufferin (who was Miss Davies of New York) , who was accompanied by her husband, was another American who did honor by her magnificence to the great occasion. Her robe was of the Georgian period, trimmed with miniver and gold thread worked in the pattern of the family badge. She wore a diamond coronet, a diamond necklace, and a loosely-hanging diamond chain fell over the laces of her dress, the front of which was ablaze with jewels, with a diamond rever looped up by three enormous bows of diamonds. Her earrings were of diamonds. The Countess of Orford (who was Miss Louise Corbin of New York)  was one of the few Americans who was accompanied by her child, little Lady Dorothy Walpole, who was one of the most animated and interested spectators of the day. Lady Orford wore fewer jewels than many present, but her necklace of rubies, pearls, and diamonds and diamond brooches were beautiful. Her dress was trimmed with old family point lace of a very rare material. The Dowager Countess Cora of Strafford (who was Mrs. S. Colgate of New York)  wore a high diamond coronet with ropes of diamonds and pearls, draped like an aigullette over the left shoulder. 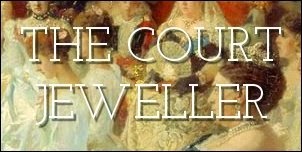 The Dowager Duchess Consuelo of Manchester's  only jewels were a diamond necklace and a diamond tiara. 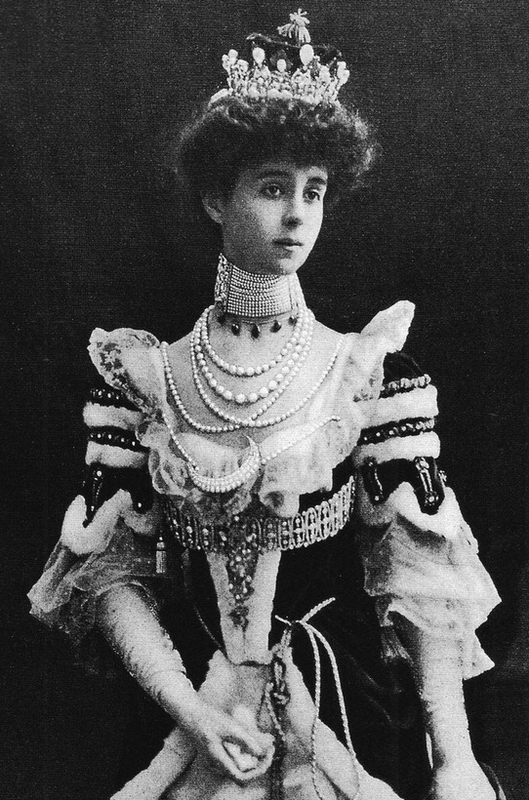 Lady Deerhurst (formerly Miss Bonynge of San Francisco) , as a peer's daughter-in-law, wore no robes, merely a dress of old lace, with a diamond tiara and some marvelous black pearls around her neck. Lady Grey Egerton (who was Miss May Cuyler, an American)  wore a coronet of diamonds and a dress of white tulle, on which were embroidered golden lillies. Her necklace was of rubies and diamonds. A fragile figure, almost bowed down by the weight of velvet robes, was the Countess of Essex (Miss Adela Grant of New York) . A slender gold cord was tied loosely around her waist and diamond chains caught up at intervals the laces of her vest. The Countess of Craven (daughter of Bradley Martin of New York)  wore a white satin underskirt covered with tulle and lace. The short sleeves of her bodice were finished with lace ruffles edged with gold thread. 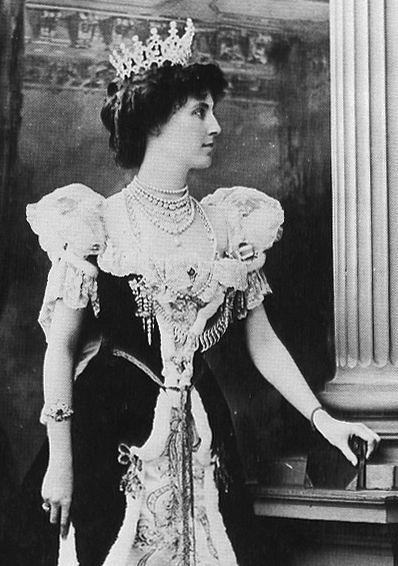 Lady Molesworth (who is a daughter of General Frost of St. Louis)  wore a tiara of diamonds. She was one of the very few who wore turquoises, her turquoise collar being particularly beautiful. From the King's box a bevy of interesting women had a view of the ceremonies, among them Mrs. Arthur Paget (daughter of the late Paran Stevens of New York)  in a white dress embroidered with bunches of grapes worked in pearls and diamonds. On her head was a magnificent tiara of emeralds set in brilliants and around her neck was a high collar of emeralds and diamonds, with a pendant to match. Her dress was fastened with brooches of emeralds and diamonds. Mrs. Ronalds (who was Miss Carter of Boston)  was a guest of the Queen in the Queen's gallery. Her gown was of satin embroidered with large bunches of silver cherries. She wore the regulation white court feathers and veil, but no train. Her ornaments were rubies and diamonds. Mrs. Cavendish Bentinck (who was Miss Livingston of New York)  was in the King's gallery. She was attired in a dress embroidered all over with mother of pearl. Among the diplomatic ladies none looked handsomer than Mme de Dominguez , the American wife of the Argentine minister, whose costume was of white crepe de chine, embroidered with wisteria and pale pink roses, and was made in princess style. On her head was a diadem of diamonds and pearls, and her necklace was of pearls and diamonds. She also wore the regulation court feathers and veil. Mrs. Joseph H. Choate , wife of the American ambassador, wore a dress of Brussels lace, with embroideries of green and flowers, while on her head she wore not only a diamond tiara, but two beautiful diamond wings, holding her long tulle veil. Around her neck was a high collar of diamonds and a diamond necklace. Mrs. Adair (who was Miss Cornelia Wadsworth of Geneseo, New York) , who went to the abbey at the King's invitation, sat in King Edward's gallery. Her dress was of gray satin, and her splendid tiara was pearls and diamonds. Lady Naylor-Leyland (Miss Chamberlain of Cleveland, Ohio)  was another of the King's guests. She was dressed in a costume of white satin, embroidered with silver lilies and with an enormous diamond tiara, a diamond necklace, and a diamond collar. The whole front of her bodice was covered with brilliants, and her shoulder straps were of the same precious stones. Mrs. Richardson Clover , wife of the American naval attache, was attired in blue satin, embroidered with silver and ornamented with opals and old point lace. Her necklace was of diamonds and pearls. She wore a collar of diamonds and pearls and a tiara of diamonds. The Queen's dress was magnificent. It was of cloth-of-gold, veiled with ivory-white tulle, and the train was of velvet lined with ermine. The costume was ornamented with elaborate bold embroideries, and the tulle overdress was embroidered with roses, thistles, and shamrocks. It finished in a high, transparent collar of old lace edged with gold. The Princess of Wales's gown was of English materials and manufacture. It had a long court train of purple velvet, edged with miniver and trimmed with wide bands of gold. A miniver cape was fastened at the shoulders with hooks of gold. The crown itself was of pure white satin, beautifully embroidered in three shades of gold and was jeweled elaborately with pearls and diamonds. 1. Theresa Vane-Tempest-Stewart, Marchioness of Londonderry (d. 1919), daughter of the 19th Earl of Shrewsbury and wife of the 6th Marquess of Londonderry. She's the peeress whose tiara famously fell into the toilet at this coronation and had to be retrieved with forceps. Oops! 2. Winifred Cavendish Bentinck, Duchess of Portland (1863-1954), wife of the 6th Duke of Portland and Mistress of the Robes to Queen Alexandra from 1913-1925. 3. Constance (Shelagh) Grosvenor, Duchess of Westminster (1876-1970), first wife of the 2nd Duke of Westminster and sister of Daisy, Princess of Pless. Her mother, Patsy Cornwallis-West, was one of the mistresses of Edward VII. 4. Enid Scudamore-Stanhope, Countess of Chesterfield (1878-1957), daughter of the 1st Baron Nunburnholme and wife of the 10th Earl of Chesterfield. 5. Consuelo Spencer-Churchill, Duchess of Marlborough (1877-1964), daughter of William Kissam Vanderbilt and first wife of the 9th Duke of Marlborough. 6. Florence Hamilton-Temple-Blackwood, Marchioness of Dufferin and Ava (d. 1925), wife of the 2nd Marquess of Dufferin and Ava. After her husband's death in 1919, she married the 4th Earl Howe. 7. Louise Walpole, Countess of Orford (d. 1909), first wife of the 5th Earl of Orford. You can see a photograph of Louise in her coronation robes here. 8. Cora Byng, Countess of Strafford (d. 1932), second wife of the 4th Earl of Strafford. Her first husband was Samuel J. Colgate -- yep, that Colgate. 9. Consuelo Montagu, Duchess of Manchester (1853-1909), widow of the 8th Duke of Manchester. She was also the godmother of Consuelo Vanderbilt, the unhappy Duchess of Westminster. 10. Virginia Coventry, Viscountess Deerhurst (1866-1948), wife of George, Viscount Deerhurst and daughter-in-law of the 9th Earl of Coventry. We previously talked about her wedding over here! 11. Mary Carolyn, Lady Grey-Egerton (d. 1959), first wife of Sir Philip Grey-Egerton, 12th Bt. 12. Adele Capell, Countess of Essex (d. 1922), wife of the 7th Earl of Essex. 13. Cornelia Craven, Countess of Craven (1877-1961), daughter of the American banker Bradley Martin and wife of the 4th Earl of Craven. 14. Jane, Lady Molesworth (d. 1913), daughter of Brigadier-General Daniel Marsh Frost and wife of Sir Lewis Molesworth, 11th Bt. 15. Minnie, Lady Paget (1853-1919), daughter of American hotel mogul Paran Stevens and wife of General Sir Arthur Paget. 16. Fanny Ronalds (1839-1916), an American socialite who, after separating from her husband, had affairs with Leonard Jerome (father of Jennie and grandfather of Winston Churchill) and Sir Arthur Sullivan (of Gilbert and Sullivan). She was also a close friend of Queen Victoria and Queen Alexandra. 17. Elizabeth Cavendish Bentinck (1855-1943), wife of William George Cavendish Bentinck, who was a great-grandson of the 3rd Duke of Portland. 18. Helene de Dominguez, wife of Vicente de Dominguez, an Argentine diplomat. 19. Caroline Choate, wife of the American ambassador. Here's a photograph of her in her coronation gown. 20. Cornelia Adair (1837-1921), the wife of an Irish landowner and a diarist who published her account of travels throughout the American west. 21. Jeanie, Lady Naylor-Leyland (1868-1932), widow of Sir Herbert Naylor-Leyland, 1st Bt. 22. Mary Eudora Clover (1860-1920), daughter of Senator John F. Miller of Alaska and wife of Rear Admiral Richardson Clover.